This was a ballgame until there were about 35 seconds remaining. But that’s just not good enough anymore. This was a winnable game at home that was TIED with 70+ seconds remaining in the second half. Coach Lewis Preston told Brandon Dawson and the KSU Nation after the FGCU game that he will get more playing time. He played FOUR minutes last night. Preston said last night after the game that he is tired of asking guys to step up, and he just won’t play them anymore. What does that mean? We’ll see. Kennesaw had about 24 points in the paint at halftime and finished the game with 38. It seems like other teams adjust and we can’t make those adjustment for whatever reasons. 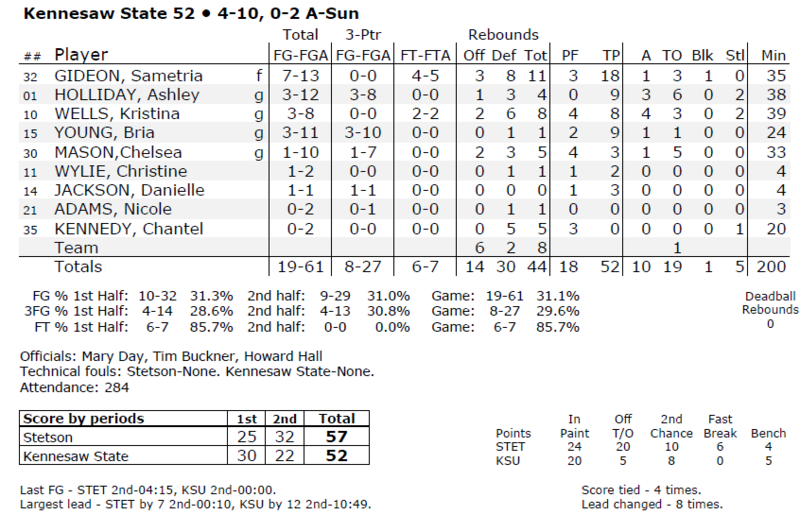 KSU shot 18.8% from three. That speaks for itself. Stetson shot 61%, let me repeat that, 61% for the game. 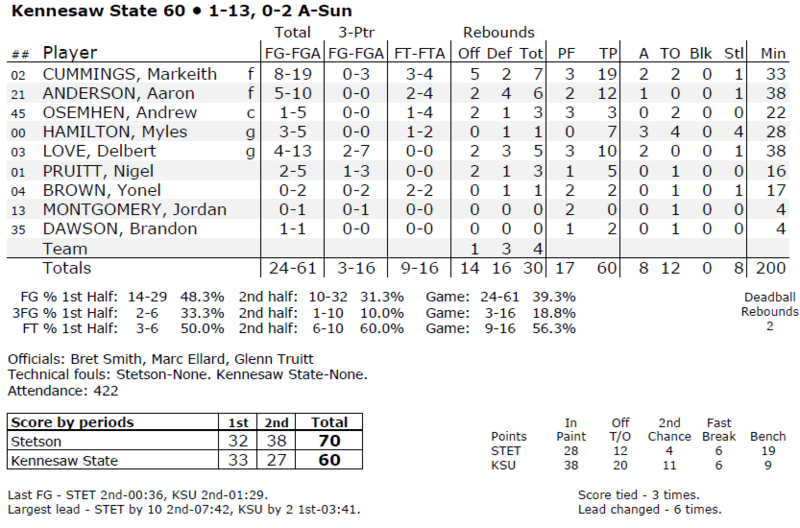 The only things that kept KSU in this were 14 offensive rebounds and winning the turnover battle. Unfortunately, KSU just doesn’t have the personnel this year to clamp down on other teams when they slash or establish position on the low block. I didn’t understand some of the substitutions, especially in the second half. I’ll leave it at that. I think the effort is there, but the talent is not. (Most of) these guys want to win, and I feel for them because they are truly trying, but they just don’t have the makeup/experience to pull out games when other teams go for the kill. Stetson relied on their veteran guards to make things happen in crunch time. I think Myles Hamilton will be this guy eventually, just not yet. KSU won the first half by a single point for the second game in a row. There was a play when KSU inbounded from behind Stetson’s basket and threw it to Andrew Osemhen who was right at the half-court line. He caught the ball in the front court, his momentum took him back a step and a backcourt violation was called. This basically summed up the season to date. KSU was up 12 with 10:49 to play. Stetson played an aggressive 2-1-2 zone and the Owls didn’t know what to do. They didn’t attack, they didn’t really do anything productive except turn the ball over. This game got away via a huge collapse. We have to give credit to Stetson. They played some great defense and overcame their awful shooting. Victoria McGowan was a one woman show. She got to the line 17 times and scored 33 points. She scored 58% of her team’s points and they won the game. Kristina Wells and Sametria Gideon were the standout performers. Danielle Jackson scored her first career points. The walk-on from Atlanta Metropolitan College hit a three pointer from the corner. The Owls did a good job of beating the full court press but they really could have used experienced point guard. Zero fast break points for KSU. Chelsea Mason isn’t afraid to take big shots.